Azerbaijan - the Land of Fires!Azerbaijan - a miraculous country with its rich natural resources, and ancient culture, history and people; whose lifestyle presents a unique and harmonious combination of the traditions and ceremonies of many different cultures and civilizations. The policy of "Open Doors" carried out by the Azerbaijan government, as well as the social and economic reformation and democratization of society carried out in the Republic, have allowed many more citizens of independent Azerbaijan to expand the scope of their worldview, and to receive wonderful opportunities to visit foreign countries. 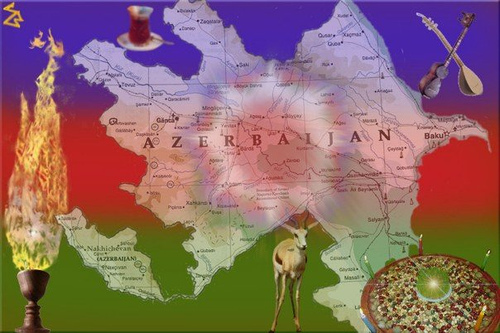 Visits of foreign tourists to Azerbaijan are also increasing day by day. Azerbaijan has great potential for the development of the tourism industry – with such fascinating sights as ancient cities, palaces, fortresses, mausoleums, and mosques. Azerbaijan has always been famous for its sources of eternal fire - the "atashgehs”. There is a place called Yanardag (blazing mountain) in Absheron and thermal springs in some parts of Nakhichievan, Kelbejar, Masali, Lenkoran, and Babadag provinces. Azerbaijan is endowed with picturesque natural landscapes, monuments of culture and modern tourist resorts. The Khudat-Yalama seacoast, bordered by forests, and the seashores of Absheron and Lankaran are fine places for recreation and relaxation. In these places, there are fine sandy beaches with steady water temperatures of 22-26°C for five or more months, which provide for a long swimming season. The most attractive areas for Alpinism and winter sports are Shamakhi and Gusar. Many types of animals and birds are objects of licensed hunting, and in the reserves they are very easy to watch and photograph. In particular, the Gizilagach reserve, where in the winter months more than one million individuals from two hundred species of birds of passage gather, is ideal for this purpose. Baku and the Absheron peninsula; Nakhchivan, Guba-Khachmaz, Sheki-Zagatala, and Lankaran-Astara regions; and the historical areas of Shirvan and Ganjabasar are the most attractive for tourists in Azerbaijan. The lovely nature of these places, numerous ancient ruins, wonderful ethnographic variety and the astonishing skills of local craftsmen will leave an unforgettable impression of Azerbaijan upon its guests.